Hope everyone is enjoying their holidays! I'm just coming out of my Christmas fog and getting ready for a fun New Year's Eve. 2016 was a crazy busy and fun year. We expanded our design team by hiring Ashley my super talented design assistant and two amazing interior design interns Taylor and Madeline both from Drexel University. They've been brought on board to help me manage the business side and the many details that go along with running a business so I can focus more on the big picture of designing beautiful spaces and less time on the paperwork. Yay for me! They've also brought their unique take on interiors and design aesthetic which I love to nurture and see grow. Looking back to summer --here's a little slice of a fun beach project we worked on... not the best pictures (iphone) but we tried! Another view so you can see the black penny tile. BEFORE ---This is where we started. Definitely a MAJOR improvement. Major. We moved the commode over to the left so when you open the door you see the fabulous sink, crazy good schumacher wallpaper, mirror and light. 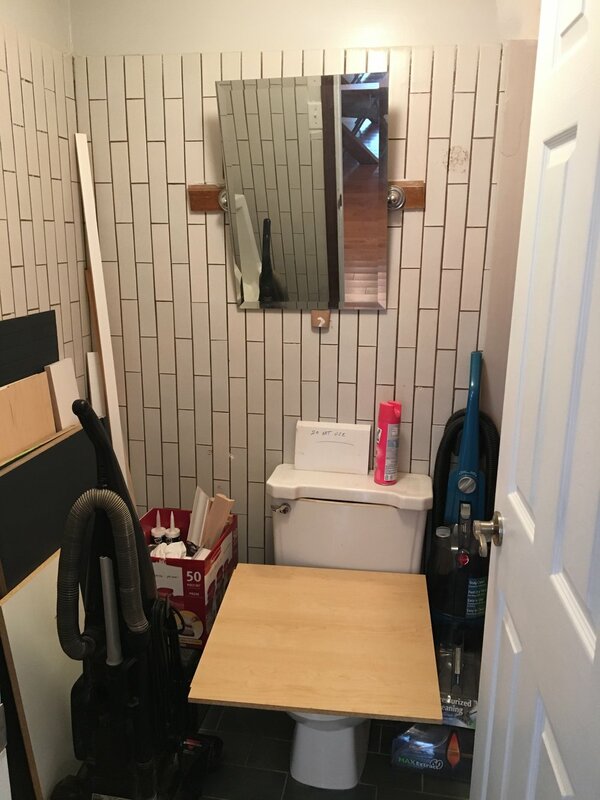 It's the cutest little powder room. My client and I decided we need to keep the door open all the time so we can enjoy the view. When doing a renovation or decorating project always keep in mind the focal wall or visual when you open the door or first walk into a room -- that space or area you first lay your eyes on should have the most impact! We also worked on this home's family room, laundry room, master bedroom and master bath which I'll share at some point now that I'm able to blog more thanks to my top-notch design staff:) So keep checking back! Next up is a large renovation we have been working on for over six months. It's a peek into what you'll see from us in 2017. Here's the before of the home's kitchen. Here is where we are now-- obviously a total gut on the kitchen and custom kitchen was designed. This is where we are so far-- the lighting still needs to be installed and finishing details will be coming soon. Loved working on this project from beginning to end and watching it unfold over the last few months. Every site visit was more amazing than the last. And take a close look at these floors ...a dark walnut stain was applied to white oak character grade hardwoods. Stunning! And the best part of this project? These clients could not be nicer and the architect and builder on this project are the best around. Extremely talented, hard working and respectful. That's it for now --- keep coming back for more before and after pictures of projects my team and I are working on!